Anya Borzakovskaya is a teen who rejects her immigrant origins and tries very hard to "fit in" among her typical high school flock. An unrequited crush, an eager-and-friendly fellow immigrant, a mostly-selfish friend, plus a curious little brother and an overly-loving mother all add up to a full range of emotions surging through her teenage biochemistry. Add to this a 100-something year old ghost, Emily, who died 90 years ago. A seemingly understanding, friendly ghost who inches her way into Anya's life and turns it upside down with her dark thoughts and overbearing attitude. Anya has it tough indeed. However, most of her troubles are self-wrought. 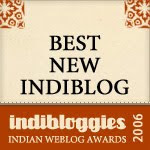 I could easily understand Anya's struggles in terms of shedding her original cultural identity -- from her determination to overcome her accent, to her resorting to shortening a difficult-to-pronounce last name, to her need to distance herself from a fellow-countryman who is still exhibiting the eager-foreigner impulse -- all because she wants to feel totally accultured in her new country. Walking along one day while agonizing over her expanding thighs and irritation at her mom's home-country-cooking, Anya tumbles into a tunnel with very little hope of being rescued. Which is where she meets Emily, the ghost, eager for companionship. Anya is not necessarily ugly, but she is not exceptionally beautiful in the classical sense either. She is just another awkward teenager who is trying to find her place. While it was troubling to read about casual smoking among the high school kids, Anya seems to have it under control. She seems like a kid who will turn out all right when she grows up. The panels flow effortless to tell the story. The grays and deep violets, and the diaphanous ghost, add to the drama of the storytelling. Dialogues are perfectly rendered, the crisp words are smart and believable. Of course, I couldn't help but feel a kinship as Ms. Brosgol lives and works in my current city of domicile. 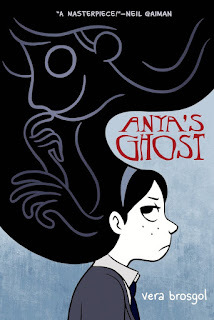 "Anya's Ghost" is one half ghost story, one half high-school/coming-of-age tale. And it's a superb, eerie story right to the end.